If you have a dog, you know just how quickly foul-smelling gas from your pooch can clear a room. If this scenario sounds (and smells) familiar, it won’t shock you to hear that your dog has bad gas. Flatulence in dogs can be perfectly normal. But if it’s excessive, you’ll be happy to hear that there are some great remedies that may just help you and your pup breathe easier! Dogs are lovable companions and loyal sidekicks. So, putting up with a little foul-smelling gas from time to time seems like a small price to pay for such adoration from our four-legged friends. But if your dog has bad gas, and it seems excessive, it’s important to know what may be causing it. As always, if you’re unsure of the cause, always start out by consulting your veterinarian. Another likely cause, and one that should definitely be referred to your veterinarian, is gastrointestinal (GI) and bacterial issues. These are harder to for the average person to pinpoint, but your vet can run standard tests to see if there is something more going on with your dog’s digestion. Diet is one of the largest contributing factors to doggy flatulence, and it’s one that can be remedied in a number of ways. Also, take a look at what the top ingredients are in your dog’s food. 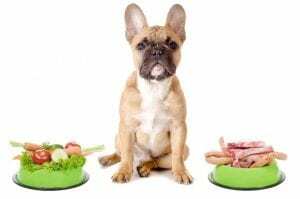 Dog foods that have lots of protein can be great, but your pup’s digestive system might react to the sources of that protein very differently. For example, some dog foods are heavy on wheat gluten as their main protein source, while others have red meat as the main source. If your pup is having major gas problems, consider changing up the primary sources of protein in their diet. Changing the sources of protein (and how much of it your dog is eating) can change how much undigested protein makes its way into your pup’s gut – where it may (or may not) ferment and cause flatulence.2 For example, if the main protein in your dog’s food is fish, consider switching dog foods to something that has chicken as the primary protein. a. Introduce some water to your dog’s dry food. 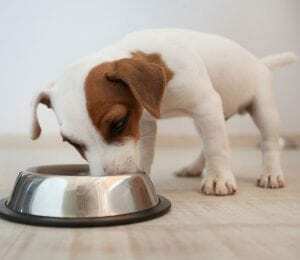 Your dog will be lapping water as they eat, slowing down how fast they’re consuming the kibble. b. Consider investing in a specially made dog food bowl, designed to make it harder for your pup to wolf down their meal in a few huge gulps. So, to help curb your dog’s bad gas, nix the table scraps. Sometimes, even a gradual change in diet doesn’t seem to help the fact that your dog has bad gas. If your dog is still suffering from excessive gas, it is best to consult your vet. In some cases, the source of your dog’s gas could be bacterial or from common canine parasites. If you notice that your dog is more lethargic than usual, or their belly is tender when you pet them, definitely bring them in to see your veterinarian. The causes of gas in dogs are many, but the results are often the same: stinky, room-clearing toots. Whether your dog has always had bad gas, or it is something new, evaluating their diet and the ingredients in their food, removing human food from their diet, and consulting your vet are all viable options.